Puerto Morelos is a place of wonderful underwater beauty. Facing the coast, there is Puerto Morelos Reef National Park, which is part of the second largest reef barrier in the world. 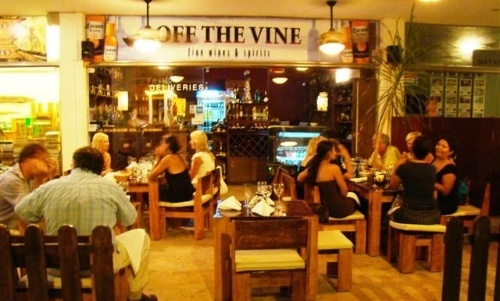 The mangroves, the cenotes and an exuberant jungle make this place a natural beauty in itself. The Puerto Morelos Reef National Park is part of the second largest reef barrier in the world, called "The Great Western Atlantic Ocean Coral Reef Belt" and is located 500 m. from the beach. 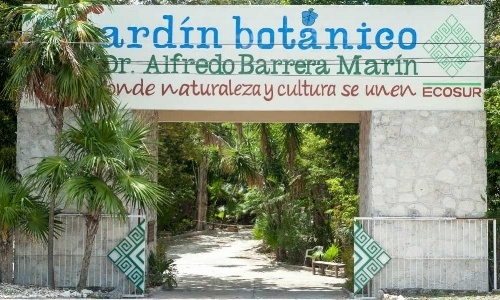 South of this place, there is a sanctuary of the Mayan jungle that works as a botanical garden, where you can find local flora and fauna. To the north, there is a zoo specialized in crocodiles. Originally, all products extracted from the jungle, such as cedar, chechen, vanilla and chewing gum, were exported from here. 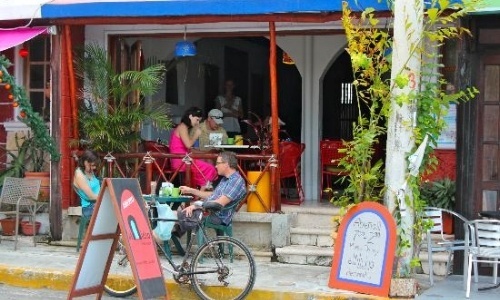 It used to be a fishing village with wooden houses, a pier and a lighthouse that was tilted by the passage of a strong hurricane in September of 1967, which has become the trademark of this place. From the construction of the first hotel, its career as a tourist spot started. 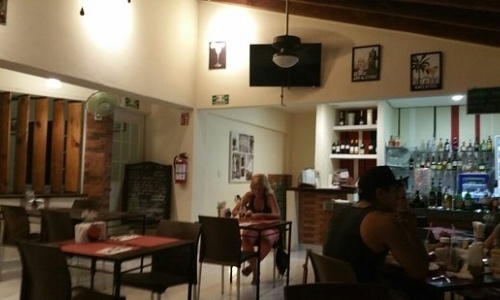 Puerto Morelos holds surprises in its hotels. There, you can find the first clothing-optional resort in Mexico. Here’s a list with the best accommodation options. 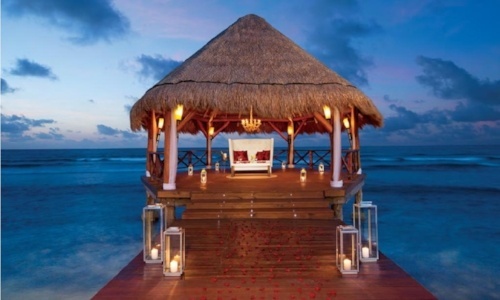 Desire Resort & Spa Riviera Maya: the first resort of its kind in Mexico, exclusive for couples, that releases your imagination and stimulates your senses, allowing fantasies to become reality. Clothing is optional. 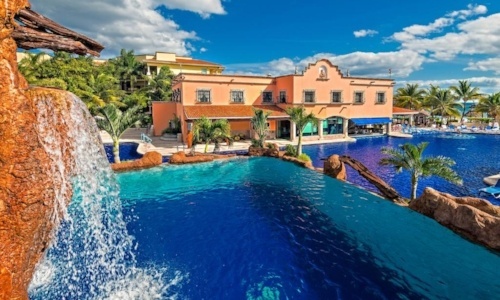 Desire Pearl Resort & Spa Riviera Maya: with an architectural design that resembles an elegant villa, perfect for the jungle environment of the region, this clothing-optional resort has rooms, suites and penthouses with a balcony or terrace. Acamaya Reef Cabanas & Beach Bar. This Eco-hotel is perfect for weddings of up to 100 guests. 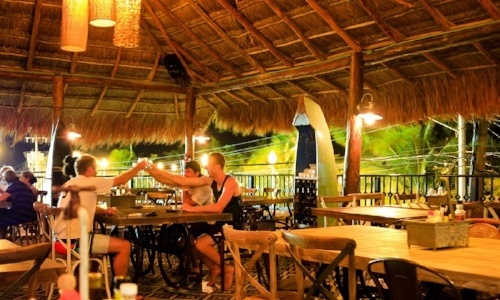 Hotel Azul Beach: includes candlelit dinners on the beach and butler service for four-poster beach beds. 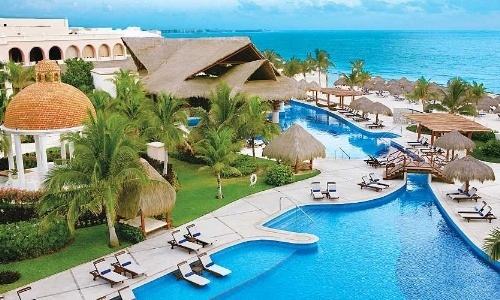 It has a pure-lobster menu, 24-hour room service and over 30 types of tequila in the tequila lounge. It is a family atmosphere that has its own vacation coordinator and all the comforts so that your children have fun just like you. 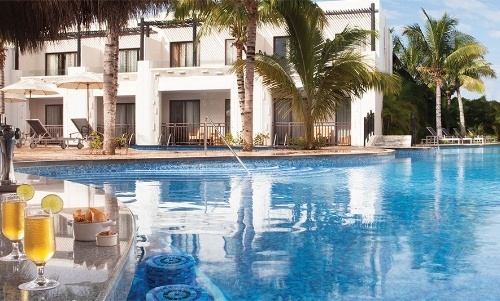 Hotel Azul Sensatori: its suites have a hot tub for two people in the "Lazy River" of the terrace. Marina El Cid Spa & Beach Resort Hotel: this first-class all-inclusive hotel in the Riviera Maya, is a family-oriented destination that offers a wide range of amenities, including exclusive restaurants, a modern spa, a new convention center, a magnificent 2452 square yard swimming pool, and a marina with full services and capacity for 120 boats. Plus, there’s an innovative habitat where you can swim with dolphins in the sea. 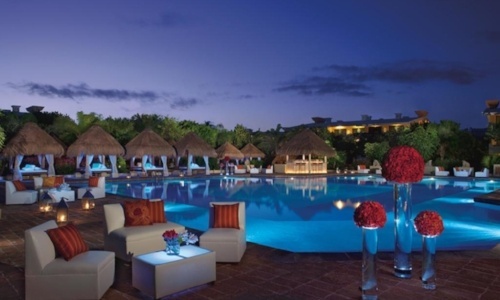 Dreams Riviera Cancun Hotel: located within 30 minutes from the vibrant Cancun, near Playa del Carmen and many other fascinating attractions of the Riviera Maya. It is a magnificent place where you can enjoy the Unlimited-Luxury® concept. Casa Caribe Puerto Morelos Seaside B&B Retreat: located just in front of the beach, only 5 minutes from the town square and the best restaurants in Puerto Morelos. It features a Mexican-style breakfast, designed by Chef Pablo from the Little Mexican Cooking School, and served on the terrace. Secrets Silversands Riviera Cancún: Enjoy a romantic dinner or with friends in one of the eight gourmet restaurants or the sophisticated bars. Zoëtry Paraíso de la Bonita: here, you get to automatically enjoy the benefits of Endless Privileges ™, which include luxury accommodations and amenities, a daily restocked minibar, 24/7 food at gourmet restaurants, unlimited beverages and many other activities and services..
Now Sapphire Riviera Cancún: get total access -without reservation and without a bracelet- to exquisite delicacies in gourmet restaurants, as well as premium cocktails in elegant bars and lounges, as well as a relaxing spa. Includes luxurious bathrobes and slippers, two-person Jacuzzi, private and furnished balcony, beach and pool waiters, themed parties and nearby activities at archaeological sites and in Puerto Morelos Reef National Park. 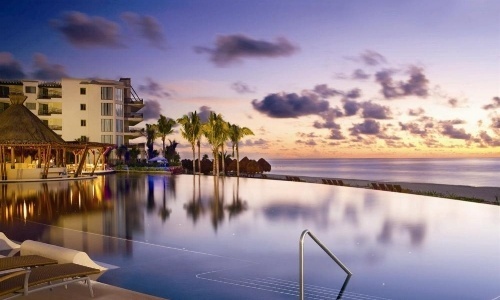 Now Jade Riviera Cancun: this hideaway is located within a beautiful beach, a few steps from the crystal waters of the Caribbean Sea and less than a mile from the Great Barrier Reef of the Western Atlantic. 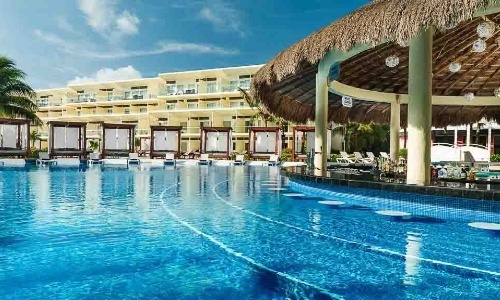 Excellence Riviera Maya Cancun Resort: this adult-only world revolves around six pools, well-equipped rooms, gourmet cuisine and a spa. 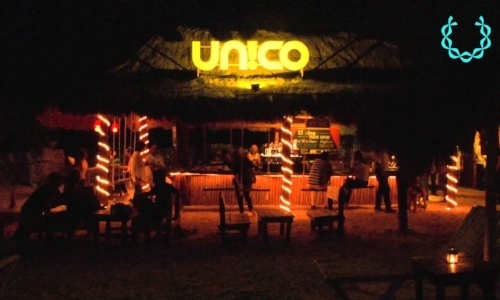 The nightlife in this coastal town is characterized by a relaxed atmosphere in its beach bars and live music, by national and international groups. The Cenotes Route: the Leona Vicario-Central Vallarta-Puerto Morelos route is the way to access several cenotes, which are fed by underground rivers. Most can be visited to swim in its waters surrounded by jungle. In the town of Puerto Morelos you can rent ATVs to do the tour. Crococun Zoo: two kilometers north of Puerto Morelos, on route 307, you can find a crocodile farm, where boas, deer, spider monkeys, ocelots, among others, also live and it is possible to interact with some species . Delphinus Puerto Morelos / Nature Connection: Connect with nature in a modern habitat in the middle of the sea. Ecological parks: there are two recreational ecological parks. One is on the cenotes route, which has zip lines, bicycles and access to one of the cenotes. The second is located north of the Luis Donaldo Colosio settlement, and offers hiking, survival courses, gotcha and rappel. Horseback Riding: Five kilometers south of Puerto Morelos, on route 307, there is a ranch where it is possible to go horseback riding in the jungle and on the coast. 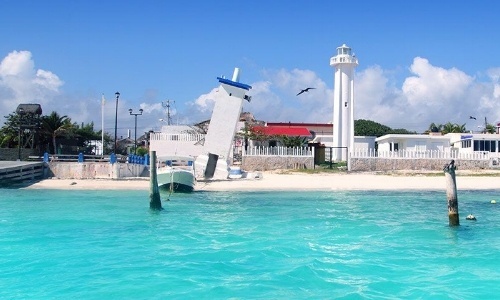 Marina: Half a mile south of the town of Puerto Morelos, there is a marina with the capacity to hold 120 boats. Navigation is allowed following the guidelines of the park and the port captaincy. Mangroves: On the access road to the town, there are some viewpoints towards the mangrove swamp, where you can observe the local flora and fauna. Hunab-Ku Handicraft Market: South of the main square, this center is located, built and intended for local artisans. Now that you know all the possibilities that this small charming city has, visit it on your next vacation and take the opportunity to swim with dolphins in Puerto Morelos. In addition, you can visit its natural habitat on board a transparent kayak. You want to know more? Book with us!